Research into poultry disease and its management is vital – but the application and communication of that science is crucial to get that information into the hands of producers. 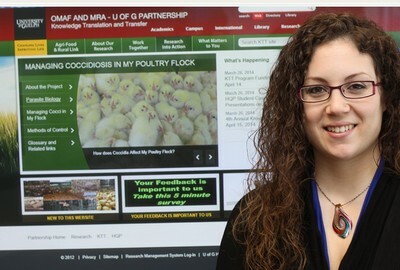 A new self-guided DVD and smart phone accessible website is closing the link between academia, industry, government and poultry producers to help combat coccidiosis, a costly poultry disease. Coccidiosis, caused by the Eimeria parasite, is a common disease for both large and small poultry operations that can impact gut health and performance with a significant economic impact for producers, says Kayla Price, a University of Guelph doctoral student researching coccidiosis management and control, supervised by parasitologist Dr. John Barta. Coccidiosis is present wherever poultry are raised with an annual cost globally of about $2.4 billion. The DVD is being distributed in the April issue of Canadian Poultry Magazine. The DVD’s cover will feature a QR code for a complementary website with additional features (www.uoguelph.ca/cocci). Funded by the Ontario Ministry of Agriculture and Food’s (OMAF) Knowledge Translation and Transfer (KTT) program, the Poultry Industry Council and members of the poultry industry, the resource brings information together in one user-friendly format. The KTT program was set up by OMAF and MRA to promote exchange and presentation of knowledge between academia and industry in an objective, agenda-free way with input from many collaborators and groups. In addition to information about the parasite, including its life cycle, characteristics and interaction with other poultry diseases, the project outlines methods of control, including biosecurity, live vaccines, and anticoccidial drugs, bringing practical on-farm management methods together with scientific research. Producers can access information targeted to their type of operation. This information is not intended to replace proper veterinary care, but rather to provide reliable, focused education. Bridging the gap between scientific research and agricultural producers is one of the most important steps in helping producers manage this common poultry disease, says Price. The project aims to foster proactive coccidiosis control management, says Price. The problem of coccidiosis is mostly due to a lack of understanding of the parasite which leads to confusion in how to deal with it and properly manage the disease. Understanding the basic biology and life cycle of the parasite helps producers to manage it better, says Price. This background also helps producers ask the right questions to, and work more effectively with, their veterinarian, their feed mill and pharmaceutical representatives. Price wanted the resource to be as comprehensive as possible, with information for as many production systems and control methods as feasible. “This approach facilitates learning and makes academic research accessible,” says Price. The project committee members include: Price, Pathobiology Department, University of Guelph; Dr. Gregoy Bédécarrats, Animal and Poultry Science Department, University of Guelph; Dr. Michele Guerin, Population Medicine Department, University of Guelph; Dr. Csaba Varga, Ontario Ministry of Agriculture and Food; Kobus Van-Heerden, Ceva Animal Health; Laura Bowers, Poultry Industry Council; and Dr. John Barta Dept. Pathobiology, University of Guelph.